Happy Saturday Junkies! Pam here today to share some DT Inspiration for Technique Junkies. While this post goes live this morning I am actually on vacation-at the beach! This is the first two week vacation I have taken in a very long time...but unfortunately we had to leave our fur baby girl at home with the dog sitter. 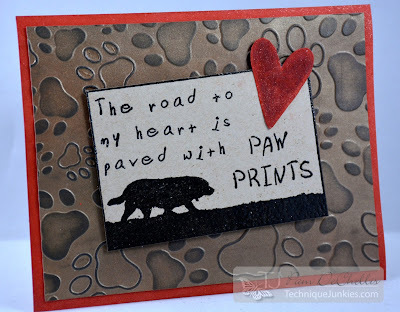 So of course we miss her which inspired me to make this project today featuring the TJ stamp SD641 Paw Prints. The background is faux textured metal using Distress ink and Perfect Pearls. The embossed portion was then inked with Archival Black. 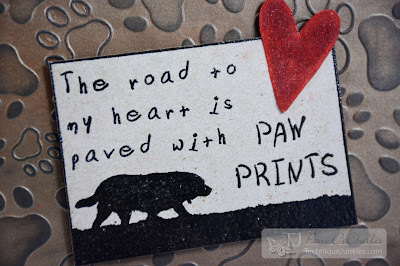 I just LOVE this stamp and sentiment-for those of you who follow my FB page you all know how much I love my pupsters! Paw Prints was stamped onto Neenah Desert Storm card stock in Versafine Black Onyx ink and covered with clear embossing powder. Thanks for joining me today and stay tuned here on the Technique Junkies DT Blog as well as my blog for more great projects featuring TJ stamps!